In our effort to bring our Ideal Knowledge Transfer concept to life, the Kymanox team often hosts a series of live, interactive webinars to bring our experience and knowledge to others. 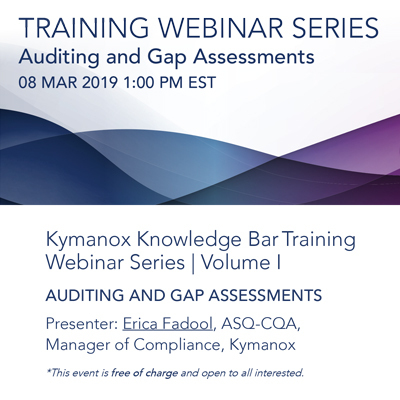 On Friday, 08MAR19, at 1:00 PM EST, the Knowledge Bar will be hosting a 1-hour webinar covering Auditing and Gap Assessments. - 1-hour interactive webinar discussing the basics of auditing and gap assessments of CGMP facilities. - Explanations from resident subject matter expert as to what makes quality audits successful. - Real-life examples from audit war-room experiences used to illustrate best-in-class practices. - Presentation followed by a Q&A session to address specific questions, concerns, and comments. Presenting will be Erica Fadool, ASQ-CQA, Manager of Compliance at Kymanox. Erica has expertise in Quality Management Systems, Quality Control (QC), Analytical Method Validation and Transfer, Equipment Qualification, Six Sigma/Kata, Aseptic Process Simulation, Process Performance Qualification, Technology and Process Transfer, Commercial Startup, and Auditing. During her career, Erica has directly supported Food and Drug Administration (FDA) Pre-Approval Inspections (PAIs), bi-annual inspections, and Biologics License Application (BLA) submissions to FDA and the European Medicines Agency (EMA). She has performed Mock Pre- Approval Inspections for Medical Device and Small Molecule Drug manufacturers to ensure licensure approval by regulatory agencies. Erica has a Bachelor of Science Degree in Chemistry from North Carolina State University. She is a Certified Quality Auditor (CQA) through the American Society for Quality (ASQ) and is a certified Six Sigma Green Belt.